Baking and Cooking, A Tale of Two Loves: 1st Online Bake Sale Update and Lemon Strawberry Bread Shortcake! 1st Online Bake Sale Update and Lemon Strawberry Bread Shortcake! I know that is there are still several weeks to sign up for the May 4th event, and people are busy. To sign up send an e-mail to me at beckysbakingandcooking@gmail.com. You'll have to copy and paste this in your browser. The deadline to donate is Thursday, April 28th If you don't have time to bake, you can always be a bidder, or just make a donation on My Donation Page, which will go directly to the American Cancer Society. I also have a badge on the top right of blog page , which connects directly to my donation page. Lots of ways to contribute! Thank you for your support in this very important cause, which is in honor of mybrother going through his third round of chemo for a rare type of Leukemia, and all the the people fighting the battle of their life against cancer, including Lora, The Cake Duchess. Please keep them all in your prayers. Now we all need a treat now and then. I got this idea to use the Lemon Strawberry Bread to make Short Cake, from Brandie, at The Country Cook. Thanks, Brandie! What could be better than two thick pieces of my Lemon Strawberry Bread, with luscious juicy strawberries sandwiched in between, and topped with creamy mounds of whipped cream and topped with a strawberry? Nothing I know of. my husband and I shared this magnificent piece of Lemon Strawberry Bread Short Cake. If you didn't have a reason to make this Lemon Strawberry Bread before, you sure do now. Because there is Greek yogurt in the bread, the texture is much like pound cake. Click here for recipe for the Lemon Strawberry Bread. Wash, hull, and slice berries. Mash or macerate berries, until slightly juicy. Set aside. Pour whipping cream into bowl mixer, with whip attachment. Slowly beat cream until it begins to thicken.. Then beat on medium speed until soft peaks form. don't beat t long, or you will end up with butter! Gradually add powdered sugar, as desired, along with vanilla.Refrigerate until ready to use. I sent you an email, but I don't know if it went through. Count me in. I'll send another. Becky, I made a donation through your donation page. I wish I had all the money in the world to give. I am truly praying for a cure! 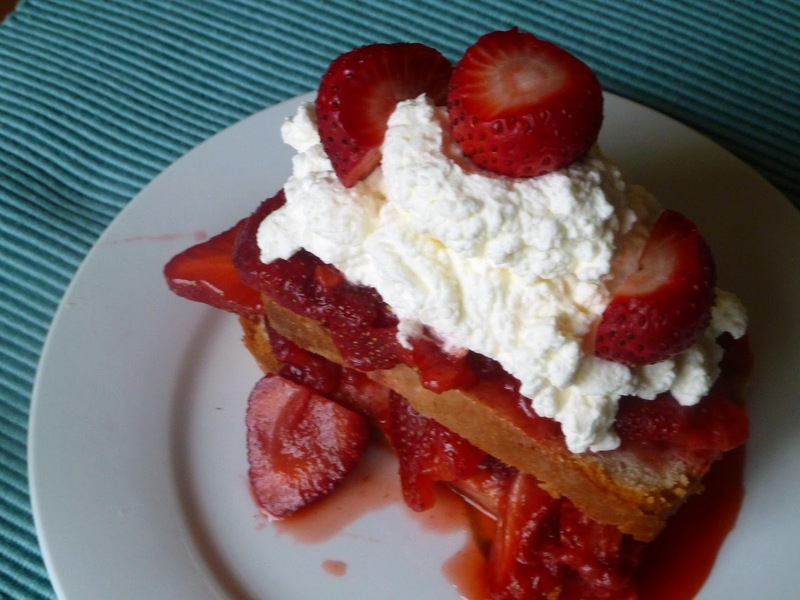 Becky, this looks wonderful and I love how you used your lemon strawberry bread to make the shortcake. Sounds delicious! Gina- Thank you for signing up to participate in the bake Sale. Brandie- thank you so much for your wonderful donation. Kate- Thank you for signing up to participate. Lindsey- Thank you for signing up to participate. Susi- this short cake is very good. Yum this looks delicious!! A nice summery treat!! wow, as i was scrolling through my blog list in my dashboard, i saw this picture... & just HAD to stop & click it! Natasha- If you love strawberries as much as I love strawberries, then you'll love this shortcake. Stephanie- Thanks for the comments. the is short cake is soo good. How wonderful! This lemon strawberry bread shortcake looks amazing! Natasha- This short cake is so good. Your shortcake looks absolutely delicious! You can't go wrong with lemon and strawberry! Such a perfect spring-time dessert! Kare- Thank you for your kind words.